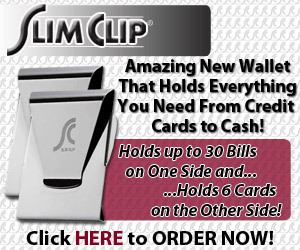 Slim Clip is the amazing new double-sided money clip that holds up to 30 bills on one side and up to six credit cards on the other! Slim Clip is engineered from durable stainless steel, so now matter how much or what the abuse, you’ll have a lifetime of use, guaranteed! If it ever breaks or bends, we’ll send you a brand new one for Free, no questions asked! As part of our special offer, you get the Slim Clip for just $5.00. That’s because for every clip you order at the special low price of $10 plus $6.99 processing and handling, you get a second clip Free! Each clip you order automatically comes with a super-bright keychain light, absolutely Free! They’re great for lighting door locks, reading menus and much more… Due to demand there is a limit of 3 of these “Buy 1 Get 1 Free” sets per order.